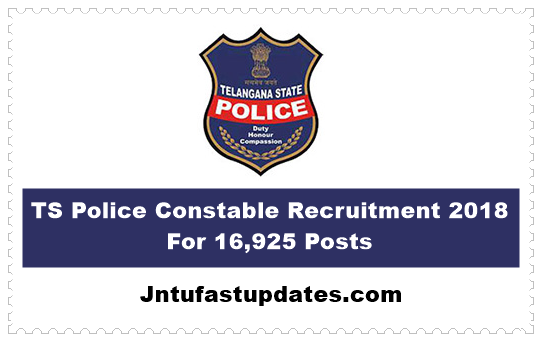 TS Police Constable Syllabus 2018: TSLPRB has announced Telangana Police Constable Recruitment Notification 2018 for 1217 Constable Vacancies. Eligible Candidates can check TS Police Constable Syllabus pdf and Exam pattern and selection process. All the registered Candidates shall be required to appear for the Preliminary Written Test in 1 (one) paper of 3 (three) hours duration for 200 marks. Hall Ticket will be issued Online for this purpose. Syllabus for the PWT is given below. 2) Questions in the Paper will be objective in nature and will be set in English, Telugu and Urdu languages. Candidates have to answer the questions on an OMR answer sheet using Blue / Black Ball Point Pen only. For this purpose Candidates should bring their own Blue / Black Ball Point Pens along with them. Candidates who qualify in the Preliminary Written Test will be informed the dates for downloading the Intimation Letter through the website www.tslprb.in for appearing in the PMT / PET with details of Venue, Date and Time. Candidates should bring the Intimation Letter when they come to attend the PMT / PET. Candidates who qualify in the above Preliminary Written Test have to undergo Physical Measurements Test and should meet the requirements. Candidates who qualify in the above Physical Measurements Test will be required to undergo the tests and qualify as specified in the notification. Candidates who qualify in the above Physical Efficiency Test will be required to appear in a Final Written Examination 1(one) paper of 3 (three) hours duration, as described below. Syllabus for this exam is given below. It is a great opportunity to archive my Goal . Sir I have completed diploma in ECE Can I apply for ASI or PC?